Attributes dictate how your car performs. There are two types of car attributes - PERFORMANCE and NON-PERFORMANCE attributes. The 4 performance attributes are power, handling, acceleration and braking. These vary from car and can be viewed from car pages when making a purchase at the dealership and on individual car pages. The basic idea is you want to match the percentiles of a track with your car's performance. Simply put - use high power cars in high power tracks, high handling in high handling, etc. There is advanced strategy varying as well depending upon the track makeup but the basics will help a player succeed against NPCs and create a positive revenue. Above is a track example. You can always view track makeup below a track name on the various race pages. 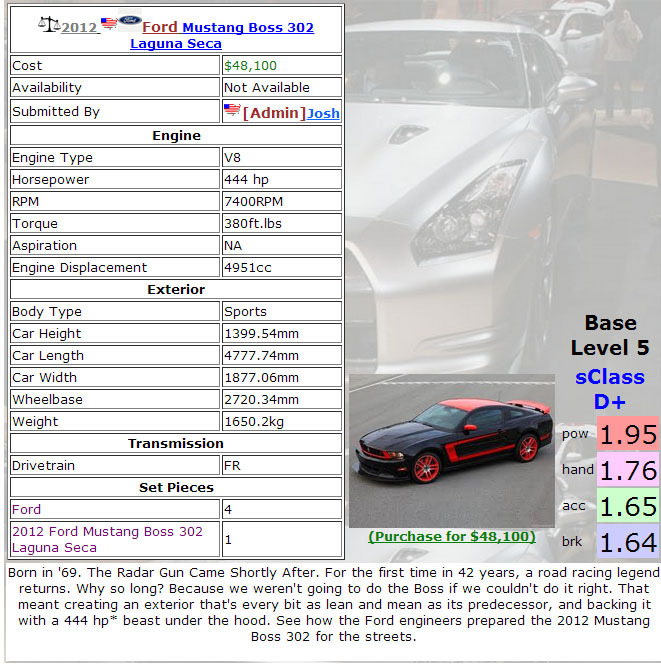 This is an example of purchasing a car - you can see the statistics in the bottom left of the car. All cars have base “1” (100%) default modifiers for all non-performance attributes. The only way to improve these attributes is to improve them yourself or add upgrade parts. The show girl improves Upgrade Part drops. This is particularly useful against NPCs who won't be using performance attribute enhancements for most cars. One of the arguably lesser useful non-performance attributes late-game, this one increases income. It can be quite useful early game, particularly with boosts from the Premium Store. A very useful early game stat due to the large gaps needed in experience, this can help enhance both player experience AND car experience. Useful with boosts from the Premium Store. This attribute is one of the few that can improve attributes due to reducing mileage penalty and also reduces accidents. It's hard to appreciate this stat as there is no notification to actual avoided accidentsdue to increases.